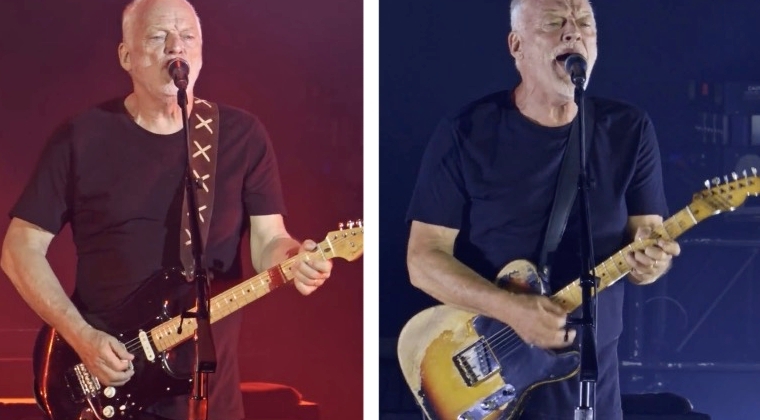 David Gilmour returned to the Roman Amphitheatre in Pompeii in July 2016 almost to the day 45 years after Pink Floyd filmed their legendary concert film at the same location. Itâ€™s a spectacular performance, with classic elements of a Pink Floyd show, a super tight band and David delivering some of his finest playing and tones. Rattle That Lock saw David return to some of his classic guitars and effect pedals, including the Black Strat, â€™55 Esquire â€œWorkmateâ€ and pedals like the Big Muff and Electric Mistress. 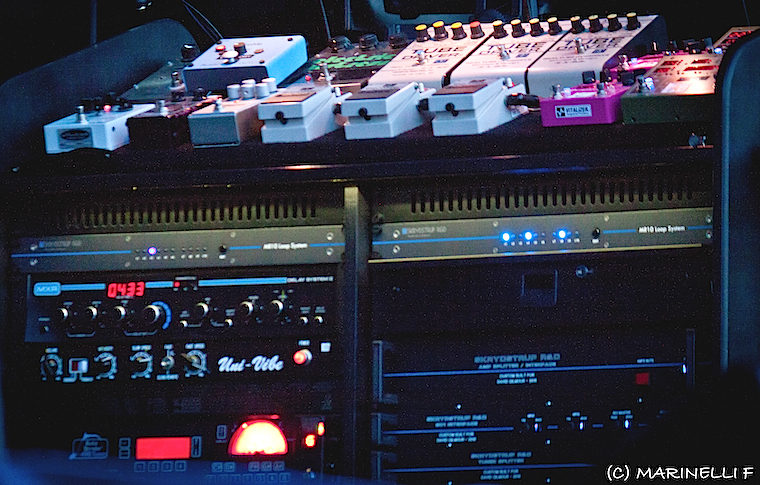 As on previous tours, David experimented with new pedals throughout the tour and his rig saw many changes. A close-up of the pedal rack. (picture by The Guardian). – The Lehle parallel L mixer was assigned to the Electric Mistress controlling the volume. – Each EQ unit can be used for multiple combinations and patches. – Each Tube Driver is set for different amounts of gain, providing clean boost, overdrive and distortion. David would also use the guitar volume control to adjust the amount of gain further. â€¨- See the Rattle That Lock tour gear guide for more detailed information on the setup. â€“ main pedalboard, controlling the pedals and rack units, with options for either single effect switching or multiple effect patches. 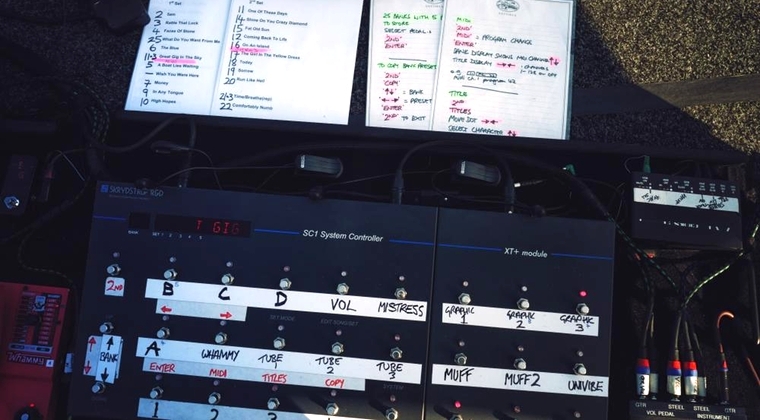 David Gilmourâ€™s stage effect rack (Brighton, UK September 5 2015 – note that some of the pedals were swapped out during the tour – see list above). – 1969 black alder body with black pickguard, Fender 1983 â€˜57 reissue maple neck and Fender â€˜71 neck and middle pickups and a Seymour Duncan custom SSL-1 bridge pickup. – 1956 model with Gibson P-90 pickups and Bigsby tremolo system. – 1955 sunburst ash body with black pickguard and maple neck. Fitted with a custom Seymour Duncan neck pickup. – Red, fitted with an EMG-H pickup. Open Em chord tuning (E B E G B E) for One of these Days. – Blonde, stock pickups. Open G chord tuning (D G D G B E) for Great Gig in the Sky and A Boat Lies Waiting. Also used for High Hopes with an open Em chord tuning (E B E G B E). – With a L.R. Baggs M1 active pickup. David playing his Black Strat and the ’55 Esquire “Workmate”. David playing the blonde Fender Deluxe and red Jedson lap steels. – With Mullard 2xEL34â€™s power tubes and 4xECC83â€™s pre-amp tubes. Modified for linked normal and brilliance inputs. Davidâ€™s only using one head. The other is a spare. – with 4Ã—12â€ Fane Crescendo metal dust cap speakers. David would normally have 3 cabinets in the setup. Davidâ€™s current stage setup is in mono â€“ all effects fed right into each amp. One Hiwatt Custom 50 head (reportedly set at the edge of breakup to get more grit) and one of the Alessandro Redbone heads are always on in combination. All pedals, racks and amps are connected with Evidence Audio Lyric HC cables. Guitars to pedalboard are connected with Evidence Audio Forte cables. Davidâ€™s using a wide range of different picks, depending on guitars, including Herco Flex Nylon 75s 1.01mm. 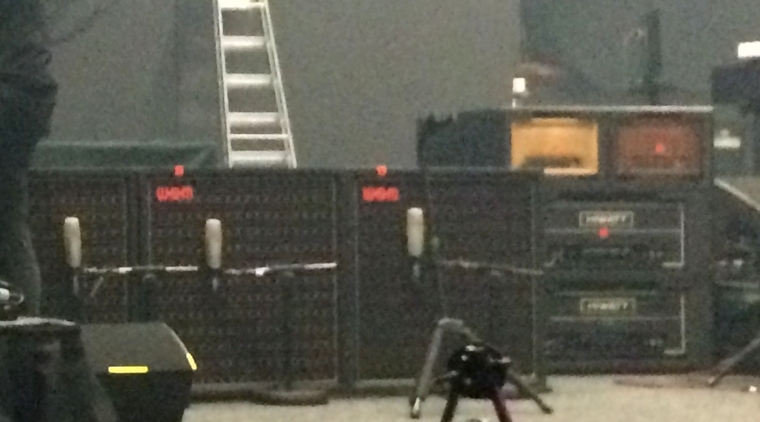 All WEM speaker cabinets are micâ€™ed with Shure KSM 32 mics slightly off centre of the cone. David Gilmour’s amp setup as seen at Brighton Centre, September 5th 2015. Two Hiwatt DR504 heads, with two Alessandro heads on top. The three WEM cabinets are each mic’ed with a Shure KSM 32 mic. See these in-depth features for more on Davidâ€™s gear: The Black Stratocaster, Telecasters, Gibson Les Pauls, Slide Guitars, Hiwatt amps & WEM cabinets and Electric Mistress. See the Rattle That Lock 2015 gear guide for a detailed rundown of Davidâ€™s recording setup. 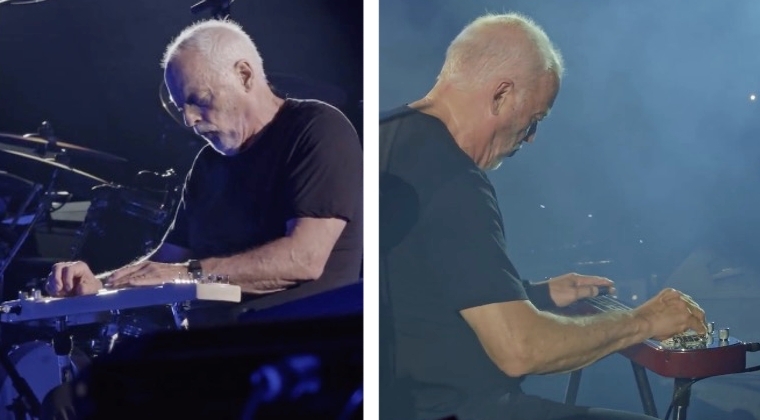 â€¨Official Rattle That Lock EPK, official David Gilmour live at Pompeii concert film and documentary, The Guardian (14 July 2016), Kit Raeâ€™s David Gilmour tone building, and David Gilmour Gear Forum. are the acoustic guitars also fed through the amps or do they go directly into the mixing desk? A guitar amp isn’t designed for acoustic guitars. They colour the tone way too much. David’s using DI pre-amps that sends the acoustics to the desk. Hello Mr. Björn, I’m a big fan of David Gilmour as guitarist and musician, but I do not have the money to afford equipment acceptable or equal to Mr. Gilmour’s, I use simulation software such as Amplitube 3 and 4 I wanted to ask you if I could advise me on which heads, speakers and pedals, not only for the solos, that’s where I use the big muff and the electric lady, but also in the overdrives and clean tones (for example, the riff of money in the Live 8 presentation) but what dismays me most is the situation of the speakers and microphones, if you could make a video on this subject would be great, thank you very much for everything and sorry for the inconvenience. PS: I am aware that nobody can get an exact sound from an emulation software. Hi Alan, sorry for the late reply. First of all, no one will sound exactly the same as David even with his equipment. My philosophy has always been that you can get very close with almost any gear as long as you know how to use that gear. I can have all the gear in the world but you can probably get better tones with software if you know how to use it. Get it? It will be too long for me to answer your Q here and it’s been a while since I used Amplitube for David’s tones but if you tap into the Custom Shop you can find Hiwatt and Fender amps, similar sounding cabs and mics and most of the pedals he’s been using. I’ve found that the Muffs and fuzz pedals doesn’t sound that good but that’s pretty much expected as these are the most difficult to reproduce digitally. Pedals like the Rat, OCD and some of the boosters will get you very close. Most of the delays and modulations, including the phase 90 and Electric Mistress sounds great. Maybe you covered this and I missed it but I’m baffled how David gets such a clean tone on “5 A.M.” using overdrive and compressor with P-90 pickups. That just sounds like a recipe for noise. Do you have any idea how he makes that work? I’m looking into compressors, possibly the Xotic SP Compressor. Fo you have any experience with that one? It all depends on the amp and how you set the pedals. He’s using the Alessandro amp for this song – both live and on the album – and it has a lot of headroom. The pedals are set very clean and the compression very high. That will produce a dynamic and smooth tone that adds a bit of bite when you hit the strings hard but stays nice and clean otherwise. Bjorn, about the effects by song. Is that a guessing or you got that somewhere? Everything is based on actual pictures and/or video of David’s gear, including this one from Pompeii 2016. Pardon my posting this in the wrong place but Stratocaster with s/n: 00001 according to Wikipedia was at one time owned by musician Henry Haynes who was Homer in the duo Homer and Jethro. Haynes died in August of 1971. Hopefully this will be a starting off point if someone wishes to research further to see if this is the same Fender Stratocaster serial number 00001 that Gilmore now owns. Thanks! There are several rumours and legends about this guitar. Not sure everyone remembers correctly or if all are true but it’s a fascinating guitar nevertheless. More here. I just wrote with my friend, who is talking to Phil Taylor from time to time and I asked him about Dave’s “mysterious” 55′ Esquire bridge pickup. He said it is the ORIGINAL Esquire pickup! Not sure if this is still news, but I was always wondering, if Seymour also wound this pickup in addition to the neck pickup. “The old Tele that I call The Workmate started out, before I had it, as an Esquire. It had had a neck pick-up added before I had it which I later changed for a Strat neck pick-up. So I did a little testing. It seems that David has the Whammy ahead of all the other pedals. So… The compression (how ever much) comes post whammy. As well as the rest of the effects chain. It takes away most of the synthetic sound. I have a whammy 5 and it seems to work well that way. One question. Reeves custom 50 or Hi-tone 50 ??? Hi Bjorn. What is your advice for affordable pedal choices to drive my Analogman bc109, going into an old DMM and into a Fender tube, in order to get close to the old echoes pompeii tone at bedroom volumes? Thanks for any help. Thanks, was looking at that one. Going back-and-forth between that or a new mxr-108s graphic eq with volume as well as gain boosts.Wondering if the tone-shaping abilities from the eq would help dial in the Pompeii tone on my small Fender tube, and also with the volume and the gain sliders… wondering how they may act as a boost (transparent) as well as to add some gain (overdrive maybe?). Your thoughts, compared to the more traditional combination of powerbooster plus fuzz? Thanks! An EQ doesn’t add gain but you can use it to drive the front end of your amp. You can shape the tone to some exent, adding more mids particularly, but an EQ alone won’t turn your amp into a Hiwatt. 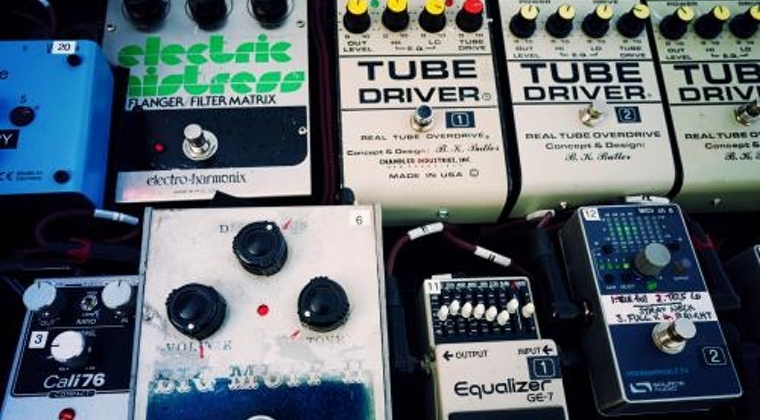 In many cases you’re better off with other pedals, like a RAT, which is designed to capture the tone you get from pairing a fuzz and a Marshall. Hey Bjorn long time no see/talk lol, It’s been literally years. Long story short, I got melted by acid at a phish and went down the Phish hole and haven’t exactly came back haha. But a lot of knowledge about amps and overdrives, and etc that I learned here has helped so much in my next tone quest. I recently watched the Pompeii show and I was hoping you would have info like which pedals were used for overdrive/distortion on which songs. I’m extremely curious about this because David since the 07/08 tour has been moving towards amp like overdrive but for this show with the two muffs, one from his two big eras. He seems to moving back to the more classic Gilmour tones that we all grew up with and learned to love. I do want to point out that I feel its funny that while Trey is expanding his sound with new pedals and amps like Gilmour did from 07-15 (or so), and Gilmour seems to have gone back to his roots after his exploration. Sorry for the long message my dude, hope you been well!! Hi Clark! Sorry for the late reply. Thanks for stopping by! David would change what pedals he used basically from night to night depending on mood and how his rig sounded in each venue. Most of his tones is either a single Tube Driver or a combination of two. All three are set up with different amount of gain. As you know he would also use a Big Muff on certain parts, like Comf Numb and Sorrow but the majority of what you hear are the Tube Drivers. Do you know how David WEM 4×12’s are wired ??? Series/parallel or parallel/ series ??? Thanks for everything so far. I have a question about how David used his amps on tour. You mentioned he incorporates a combination of his Hiwatt and Alessandro heads. Is he using the Alessandro as a preamp or running the two amps simultaneously? I recall reading somewhere before that he uses the Allesandro as a preamp sometimes, and if he does, I am curious on the specific signal chain implementation? The signal from the pedalboard is mono so splitting that into two cabinets won’t give you true stereo but in any case, and from what I understand, the intention wasn’t to achieve stereo but to have the tone from both amps blended. I didn’t like the fact they were laughing all the time while playing songs filled with atrocities about war, madness etc, I felt it just took away a lot from the general impact. Greg Phillinganes mimics at the end of Shine on you crazy diamond was absolutely out of place. Now tonewise I don’t know why but the solos on Coming back to life sounded so trebly, icepick tone, even tho He used the same setup as on Remember that night, where instead the solo sounded fat and lot gainer. I just listened to a few songs of this again and whenever he is not using delay on solos I noticed there is still this sense of space/room, to my hears REVERB. Dave is not using dedicated reverb pedals or amp reverb here, so I’m trying to figure out how he does that live … is it added in the mix or is it just the venue with the speakers in different places creating that sort of feeling? He did use much less delay on this tour and some of the settings barely have any mix or volume. He’s also mixing different delays and this and the low volume will create more reverb or ambience. Keep in mind too that the guitar, and all the instruments, are a mix between the close mic’ed cabinets and the ambience mics placed around the venue. This to create the true live experience and sound. Hi! I just saw the bluray deluxe edition of the live in pompeii. I saw DG Live in Pula in 2015, and the lineup was quite different, there was Jon Carin to keyboards and additional guitar. In the live at pompeii, during “today” i figured out that there was the third guitar part (usually played by Carin) but nobody was playng this part, and also the keyboard player was doing other stuff (the rhythm of this part is quite recognizable). So my question is: there were backing tracks/ pre recorded samples in your opinion? There are samples all over the show. What vocal mics are they using ??? Hi Thomas! Thanks for the kind words! They key to David’s Muff tones lies in how he’s using his amps. I recommend reading through the Big Muff tone guide and the amp tone guide first. Let me know if you still need help. This site has inspired me to re-exmaine Gilmour’s playing from top to bottom, and i have learned a ton about gear– amps, guitars and effects– just in general from this site. I consider it a hugely valuable resource and just wanted to leave a massive THANK YOU, bjorn, for all this hard work. Hi BjÃ¶rn ! Did David recently change pickups in Black Strat ? Hi Bjorn! Thanks so much for your EHX Green Russian Big Muff review – I bought one based on your review and LOVE it!!! (this is becoming a naughty habit, but oh, so good….)! That makes about 7 or 8 such pedals for me now…. I have a question for you about David’s use of the Digitech Whammy pedal in “The Blue” and “Marooned” – it may just come from my unfamiliarity with how the detailed settings of the Whammy pedal work, but when I tried the pedal at the music store, it kept giving me a very audible harmonized tone accompanying the dry (original) tone, and I couldn’t seem to find any setting in the pedal that would turn off the harmonized tone while allowing me to pitch shift an octave up as David does (e.g. in “The Blue” solo). I really can’t say I can hear any harmonized tone in either of those original recordings (either studio or live recordings). How does he do it? Am I missing something really easy on this? I love both songs and would like to get a Whammy pedal at some point, but only if I can make it duplicate what David is playing. Thanks in advance for any advice you might have on this! Ha ha, don’t shoot the messenger! What model did you try? David’s still using the WH1, which is supperior to any model that’s been made since. It sounds much smoother than the later models. Keep in mind that he’s always using compression, overdrive and a lot of delay on those songs so that will colour the tone and take away some of that artificial flavour. Still, if you listen to the high pitched notes in particular, you can definitely hear some of that harmonizing going on. It’s just the nature of the pedal. I have question concerning the delay. You write that David use a mono rig that is split into 2 different amplifiers. So why did he use 2 Flight Time Delay and 2 Chrono delay for mono application? Did he use only one preset on each and call it in loops? Knowing that the Flight Time have preset that could be call with the MIDI of the Skystrup. On the Guardian’s photos, we could see that he use MIDI with the EQ. So why not with the FT? Don’t you think rather that he use all the effects in mono and split into delays in each amps for more huge 3D sound, sort of wet/dry setup? In any case, thanks for all the informations and tricks that you share with us for so long. Hi, happy new year! Sorry for the late reply. As far as I can see his rig is in mono. Not sure why he used multiple units but it could be that he doesn’t want to overcomplicate things with too much programming and stomping. He’s also swapped a couple of the units during the tour, which indicates that tehy’re mostly set for one type of delay that’s easily replacable. bjorn, do you know how david makes that harmonic note on the intro of sorrow? i’ve seen he pulling a string next to the headstock but dont know for sure. Yes I’ve seen him do that a couple of times. Back in the mid 70s he would use a silicon Fuzz Faze and there sounds to be some dealy coming from the Binson with possibly 300ms. Has he changed his string gauge or something? He sounds a bit thin in some places, especially on the bridge pick up. Idk, it sounds a bit odd since he usually has a nice fat tone. Or maybe it’s because I’m not watching it on proper speakers right now? As far as I know he’s been using the same brand, GHS, and custom gauge setup since Wall. It’s documented in Phil Taylor’s Black Strat book. Checking your listening experience is always a good place to start and there could be a number of reasons why you perceive his tone as less fat but he does have a different setup compared to Pulse and Island and his amps are set for more grit and presence now. Hey Bjorn, I got a question, I know David isn’t using any modulation on The Blue but how does his guitar sound so.. “3d”? It sounds out of this world, is it the doppolas? I’m refering to the solo. Maybe is it the whammy? But as far as I know it’s just for the octave.. anyway thanks in advance!! Also thanks for the EHX Green Russian review! There’s no modulation but it sounds like there’s two different delays and the Whammy will create some modulation or a slightly processed flavour. Watching the video of Gilmour in Pompeii, we see the Civil War muff but not the Ram’s Head on the top rack… he used both muffs on that show?? It’s there upper left corner. Watch this clip at 2:08 and you’ll see it. Yep. That’s the NOS version of his signature Fender. I’m guessing Princeton. As you say, it looks too small for a Bassman and too big for a Champ. The Deluxe has a bigger front panel. Thanks Bjorn! Im finding that I like that tone much better than when he uses his hiwatts, do know of any modifications one can do to a cub12 to make it more tweed-ish? Depends on what you mean by Tweed… If you roll back the mids you should get closer to a Bassman and you can also use modelling pedals for a more Fenderish character but the amp is what it is. Sorry I should’ve said bassman-ish, that’s the tone I associate with tweed :) Anyway, I ordered a G12H Anniversary to replace the HH speaker and I was thinking of putting a ehx 12at7 in phase inverter like the original bassmans and a ehx 12Aay7 in v1 for less gain and more headroom, have you tried any tube setup like this or you’re a straight 12ax7’s guy? Hey there… the amp in the background is a LAZY J 20. I have it too and it’s a fantastic tone machine for pedals too. Hi Matthias, that’s a blues riff in the pentatonic scale in B. Bend the G string on the 9th fret one whole note, pick the B string on the 7th fret and pull off the E string on the 10th string. He’s doing it really fast so it might sound different but that’s really what he does. Typical of BB King and it’s all over David’s playing. Bjorn, a General question: How do you know all those things? I understand you listen, you look at photos available, but that may be just 30% of all Information posted by you. So what is your secret? Well, first of all I’ve been researching David’s gear for 20 years and running this site for almost 15. You learn how to spot things and listen for the details. That being said, much of what you find in the album guides are information I’ve gathered for years with lots of contributions from others. I know a lot about David’s playing and gear but I couldn’t have created this site without the help and research provided by many of my followers and readers. Fantastic job as always, Bjorn! Did you notice the Black Strat slightly out of tune on a few songs, like Coming Back to Life intro and Sorrow? Or I misheard? Watching it now and absolutely agree. In fact I googled it which is how I found your comment. Hi Bjorn, David used only muff pedal without boosted with the tube driver in the heavy dist tone? So only muff and delay? It’s probably a combination with either a compressor, EQ or Tube Driver or all three but I’ve only listed what I know. – You show 3 WEM cabs, but there were on 2 at Pompeii. There were 3 WEM cabs earlier in the tour. – You list an Alessandro Bluetick, but George himself said both were Redbone Specials on his website after attending an NYC concert and going back stage. He said David only uses the BT in the studio. I think that dark brown one has been mis-identified for years. If you go back and look at Astoria security videos from 2005 there is one with a dark brown case and blond from panel. I think that is the original Bluetick. David also used it with Jeff Beck in 2009. I looked over the signal chains for each song at Pompeii posted on the GG forum, and those contradict what you list, so I wonder which is correct? – You say each EQ was assigned to one Tube Driver, but the signal chains show the Source Audio EQ#3 was used for just about everything, including cleans and muffs. I assume it was programmed with pre-sets. Also, sometimes Tube Driver #3 was paired with EQ#2, and sometimes #3. Thanks, and I hope that helps! Hi Thomas, sorry for my late reply. Thanks for the info! Obviously, I didn’t go over the cut/paste I did from the Rattle That Lock tour info. He did do some changes along the tour and prior to this show. I’ve gone over the songs again and I can definitely hear the Mistress on Run. My source is part by ear and the footage I could find and I’m sure you guys have gone deeper than that. Still, I do hear some breakup in the tone as well and I can’t see anything listed that suggests that. I would think the Tube Driver boost is one but I haven’t seen anything. The PC-2A couldn’t do that alone with the settings David’s using. I’m also puzzled by the rhythms on Time. There’s definitely some breakup there if you listen with headphones. Could it be the slightly dirty Redbone? Thanks a lot for this great work. Do you happen to know how David sets up his bridge on the black strat: floating or flush against the body? Watch he pulls up on it. It’s flush. Read Phil Taylor’s Black Strat book. 5 A.M. also has this, at least the album version. BjÃ¶rn: I love your blog and all that comes with it. My only comment on this particular entry: as I’ve watched the live DVD and as much as I know how you’ve grown weary of it (CN) I can’t help but say the way David played the 2nd solo on Comfortably Numb was like it was his last time playing it… right at the start he does that slide up to that high note, that he hasn’t done since (has he ever done it like that?) for me signalling something great to be witnessed. Followed by a very smoothly played section where he does some old familiar stuff, but played slow and thus creating something new and fascinating and interpreting it in a new style and in an unexpected way. Halfway through he looks like he’s doing it so effortlessly.. Along the way he keeps adding hommages to those other versions like a slight hint at the seagull part and a nod at the pulse flower-opening thingy lick. And those high bends.. And that repeated riff, where he focuses all his concentration to give everything at the grand finale, where he again doesn’t disappoint and adds that bulid-up.. and seeing Guy diggin in like he knows it too.. boy if he’d had those yamahas it’d have been him playing his own requiem..
Hi, master. Greetins from Cordoba (Spain). 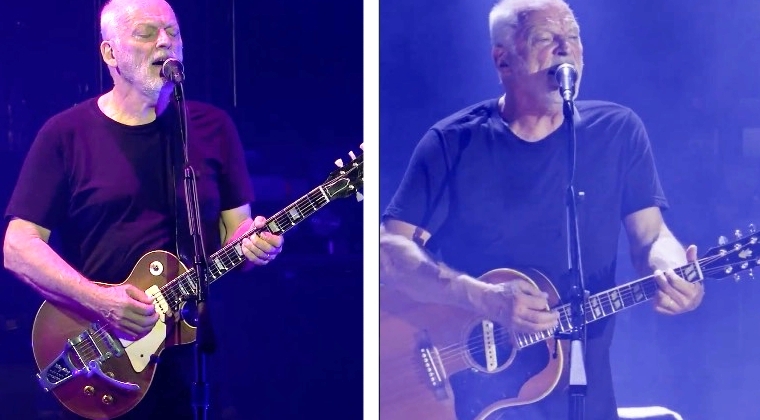 Still Gilmour using de Avalon U5 for acoustic? They’re not visible in the current rig but I haven’t found any footage showing what he might be using for the acoustics. Hi Bjorn, excellent work as always. Did anyone notice the Shine On VI-IX licks scattered about this version of One of These Days? Thought I was going mad when I noticed it at RAH in September but it’s definitely there! Hey Bjorn, Great article as always. As an extra note, and I’ll try and find you the exact source, I read a recent interview with Phil Taylor (may have been in the Guitarist article about the Endless River’s gear) where I’m sure he said that Gilmour actually ended up swapping the neck pickup in the original Black Strat for a fender Fat 50s like in the CS versions, as he’d suggested he might in previous interviews. In the Guitarist February 2015 issue, Phil talks about how they tested different pickups for the Replica and NOS Strats and that they settled for the Fat 50s neck but that was for those guitars. The original Black Strat is still described with the 1971 neck and middle from the bullett Strat and the SSL1c that they istalled in 1979. Thank you for this another great article. Lots of great stuff to learn from. Faces Of Stones – Solo 2 – Big muff? I really like this track. There’s a bit of Knopfler mood in the studio version. And live, it was a stunning moment for me. The Pompei version is beautiful. Hi FrÃ©dÃ©ric! Hope all is well :) I was a bit confused about the tone when I first heard it and it sounded too smooth for a Tube Driver. I listened to it in headphones and you’re right. It’s definitely a TD. It doesn’t have that throaty Muff tone and harmonics. I’m a bit puzzled still though. The solo on Faces and Island is much smoother, with more sustain, than say What Do You Want and Fat Old Sun, which leads me to think that it’s a combo of two TDs. I’m pretty sure that What Do You Want at least, is the distortion TD and not the OD, which probably means that Faces is a combo of the distortion and boost… or so it sounds to me. What do you think? Also, don’t forget his EQs. How do the Source Audio settings differ from the old GE-7’s? Great job mate! I never figured out what the configuration of the first and last part of Sorrow is. Do you have the description somewhere? You mean the intro riff? That’s the Civil War Big Muff and delay. The Muff is probably boosted with the clean Tube Driver. See all the setups here. Well, you need to play LOUD :) I think that’s the whole secret. Great read Bjorn! I’m glad to see that Dave decided to go with a simpler setup this time. One thing I read that got my attention was where you wrote that Dave’s Strat has ’71 neck and mid pickups plus a Seymour Duncan SSL-1 in the bridge. Is this something he did for this show? It’s the same setup he’s had since 1979. The SSL1c was a custom wound pickup from Seymour Duncan. It’s the same as the current SSL5. I understand about the bridge pickup, I should have been more clear, I was asking if he had changed the pickup selection in his custom shop strat for this show, or has he gone back to using the original set. Sorry for the confusion. Just wanted to add that I would love for Fender to reproduce the workmate tele as a custom shop guitar. I have lusted after that beauty since About Face came out on Vinyl. He used his original Black Strat for the show, with the 1971 Fender neck and middle pickups and the custom wound Seymour Duncan SSL1c bridge pickup. What is an MIDI system controller?How does it work,(in a nutshell),and is it the same as a “switcher? Once again, you are the man! The go between from men to gods. Bjorn you’ve done it again, very nice work friend! And I think I can safely speak for us all when I say it is very appreciated! Great stuff Bjorn!! There’s some tones on this tour I’ve been trying to crack for ages, especially Sorrow; turns out I just need a better Civil War clone! I sympathise with your struggle to get accurate delay settings, on both the album and the Bootlegs I can’t even hear delay on most of the songs, unless it’s the Boonar on Shine On and possibly the intro to Coming Back to Life. His compressor settings sounded fine to me when I saw him in Toronto, but they’re definitely a little much at some points on the record; I miss the days of the CS-2! I’ll definitely be sticking to a more Division Bell-era clean/drive tone for some of these tunes, but I’m chasing that Fuzz tone for sure! Thanks again for the hard work you put into this Bjorn, I can’t express to you just how much I appreciate it!